Leather-bound Book of Remembrance with hand-written inscription and names on vellum. 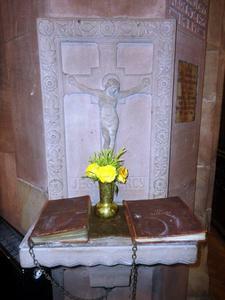 Book chained to wall-mounted stone stand (see our ref. no. 63790). 1914-1919 O LAMB OF GOD,/ IN WHOSE BLESSED BOOK/ OF LIFE, ALL THEIR NAMES ARE,/WRITTEN GIVE/ ETERNAL REST TO THE SOULS/ OF THY SERVANTS DEPARTED./ "LORD ALL PITYING JESU BLEST/GRANT THEM THINE ETERNAL REST"/ GIVEN BY MR & MRS TOLLER 1921/ THE BOOK OF NAMES OF THE MEN OF/ HAWARDEN WHO GAVE THEIR LIVES / IN THE GREAT WAR 1914-1919/ PAX/ (NAMES)/ FECIT E.C.M.S.MCMXX1/ SCRIPSIT P.R. Internal pages: Given by Mr&Mrs Toller. 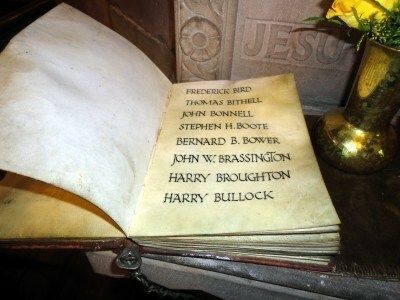 1921./ THE BOOK/ OF THE NAMES/ OF/ THE MEN OF/ HAWARDEN/ WHO GAVE THEIR/ LIVES IN THE/ GREAT WAR/ 1914-1919/ PAX/ (Names)/ FECIT E.C.M.S. MCMXXI./ SCRIPTSIT P.R. 1962: Church building listed as grade II* with Cadw. 1952: Book re-bound in stronger leather. Comments: Memorial was given by Mr and Mrs Toller in 1921. A balance held by the Welcome Home Committee covered the costs of re-binding the book in 1952.